The community of Tarzana, which is on the southwestern edge of the San Fernando Valley of Los Angeles, was named after Tarzan. 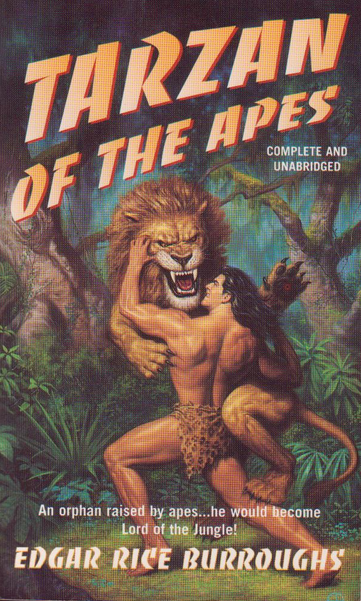 Yes, Tarzan of the Apes. When I lived in Canoga Park, which is right nearby Tarzana, and I mentioned this to people, they just kind'a smiled and edged away from me. Of course, now, with the internet, you can check this out right away. And it still sounds bizarre. But the San Fernando Valley is much older than most people realize. And when Edgar Rice Burroughs, the creator of the Tarzan books, moved there in 1919, he named his ranch after his most famous creation. And as the years went by, the name just stuck to the whole community. By the time he moved there, Tarzan of the Apes had been a best seller for years, and Burroughs was becoming a very successful author. How the people who live in Tarzana nowadays feel about their neighborhood being named after a jungle man who liked to swing through the jungle on vines, I have no idea. I would like to think that those who do know take it with a sense of humor. Of course, very few people do know about it, but since you do, when you visit Tarzana, time-travel back to 1919 when it was just a ranch named after Tarzan.